Modern extensions to the Corn Exchange are currently being demolished, allowing views of the new facades from the High Street. An online petition launched to keep Lincoln’s Corn Exchange market open has attracted over 1,000 supporters. Stallholders and market traders have criticised Lincolnshire Co-operative’s plans to close the market in a phased redevelopment project which they have committed £70 million to so far. Corn Exchange Market traders who have signed the online petition are claiming that the Co-op has told them they will be evicted, and no plans are in place to provide alternative accommodation for them. Chris Padley, who started the petition, said: “The greatest blow to the city would be the complete loss of the fresh fruit and vegetable market. “This is at a time when people are being urged to eat their “five a day” to improve health and cut NHS costs, and when the market is by the far the cheapest way of buying fresh produce, and the only source easily accessible for those without a car. In response, a spokesperson for Lincolnshire Co-op said: “Lincolnshire Co-op consulted with the public on phase one of The Cornhill Quarter scheme in February of this year. “Ahead of this, we held a private meeting with our traders to introduce the plans to them and offer the chance to ask any initial questions. We explained that we were available at any time to listen to concerns and assist in finding suitable alternative locations. “In the interim period, a number of traders have accepted our follow-up invite to individual meetings to explore these alternatives, which is an ongoing process. We have also held a further group briefing alongside Lincoln BIG. “City of Lincoln Council is currently working on its plans for improvements to the Central Market, which may include some external stalls that could provide opportunities for Cornhill traders. “We have distributed to all our traders on behalf of the council, information and an ‘expression of interest’ form, in order that they can put forward their requirements relating to this. “The council has confirmed that the provision of fresh, local produce, such as fruit and vegetables, is a priority within the reconfigured market offer. 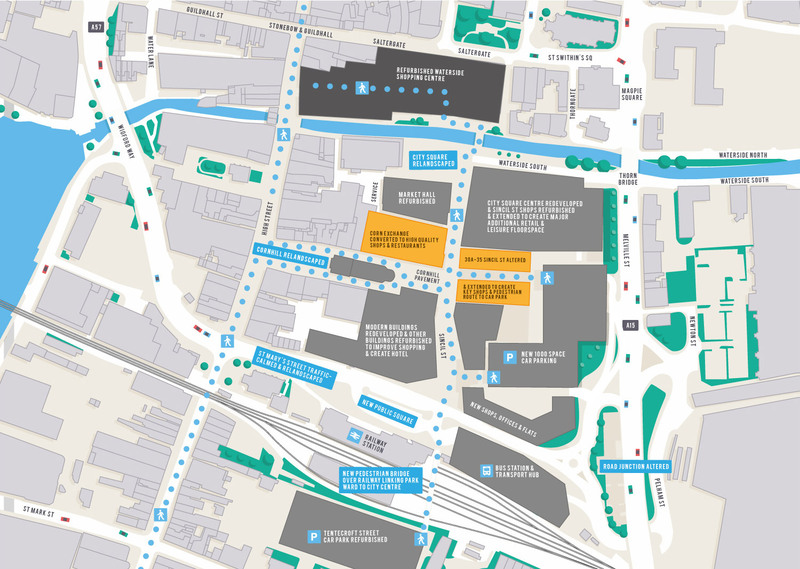 “We understand that many traders are anxious during this early stage of The Cornhill Quarter scheme, and we have made our team available to them whenever required in order to provide as many answers as we can at this point. Lincolnshire Co-op have said that the Cornhill regeneration would be completed by 2020 after a phased process of development. The scheme will in large part be funded by the Co-op, however the City of Lincoln Council has allocated its own funds and secured a grant for the Transport Hub element. Phase one of the project, which will cost around £12 million including land and buildings, will introduce five new units within the Corn Exchange, three new units within the stretch from 30a to 35 Sincil Street, and new kiosk units behind 34 and 35 Sincil Street. Modern extensions to the existing Grade II listed Corn Exchange building will be stripped away and City of Lincoln Council is developing proposals for its Market Hall. Four out of five shoppers, residents and traders said they would support the phase one proposals in a week-long public consultation held in March this year.